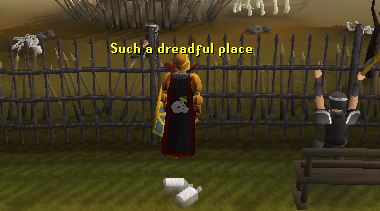 The Fight Arena, also known as the Khazard Headquarters, is a place that many wish never to go to. 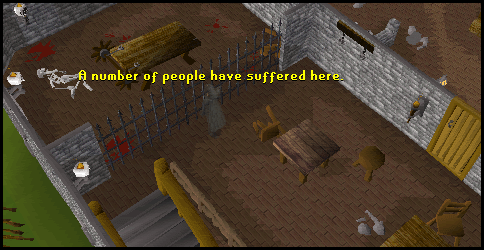 Bordering the Fight Arena is East Ardougne to the north, the Tree Gnome Village to the west, Port Khazard to the east, and Yanille to the south. The Fight Arena is a small community with only a few houses. The Fight Arena is mainly used for the Fight Arena quest, but otherwise, you won't find too many adventurers wandering around this area. 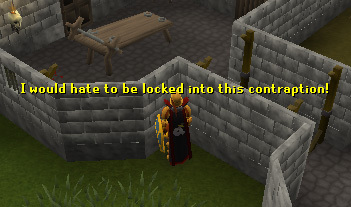 Those bold enough to step foot around the Fight Arena will most likely be training against the local guards. Here is the quest start point for the Fight Arena quest. 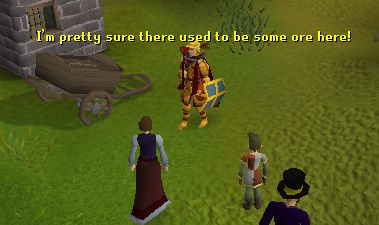 Lady Servil is here to give you the details on the quest. Other than herself, there are three un-minable rocks and a broken cart in this area. The first house in the Fight Arena features a range, as well as two beds. Other than being able to cook food in this house, it is a useless house. The second house in the Fight Arena is more useless than the first. You can find a level 23 Khazard Guard walking around in this house, but other than that, it's just two counters and some shelves. The third house within the city mainly just features some laundry additions located outside of the house, but they can't be used. 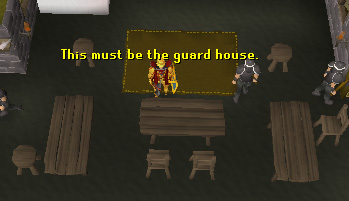 Inside of the house is a table and chair, as well as another level 23 Khazard Guard. This house actually features something useful, a sink! 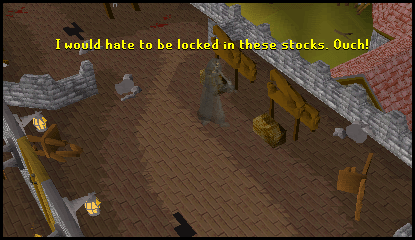 Imps may teleport in and out of this house occasionally. Also, the chest used for the Fight Arena quest is located in here. Inside of the chest, you will find a Khazard Helm and Khazard Armour, so if you lost your pair during the quest, you can obtain another by searching the chest. 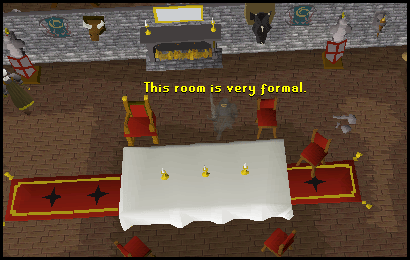 A table and chair can be found in the house otherwise. This house features four level 23 Khazard Guards and another sink. There is also a cupboard, but there is nothing inside of it. 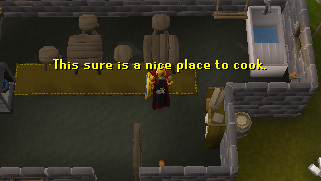 Other than some tables, chairs, and stools, this is another useless house apart from the sink, of if you're looking to train on some low level humans. Yet another house with guards and a sink. There's also the usual table and chair setup here. Another basic house in the city. Finally, an area of the city that is actually exciting. The entrance of the Fight Arena is mainly used as a prison, housing a number of slaves and Khazard Guards. To enter either side of the Fight Arena, you will need to be wielding the Khazard Helm and Armour. At the northern entrance, you will find Jeremy Servil, son of Lady Servil. He is your key to entering the Fight Arena itself. Other than Jeremy, there's a few slaves here. Moving to the end of the room, you will find a rack, which is apparently a torture device used against the slaves. Entering the room to the south, you won't find much here. Just a few tables and stools, and another Khazard Guard. The second floor doesn't include very much. 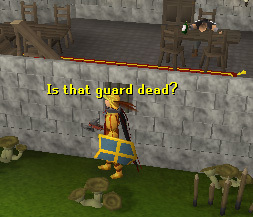 There are no guards up here, so this is a very useless area. 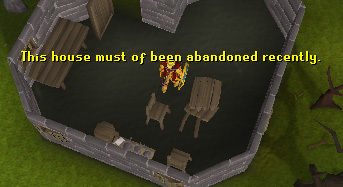 There are more tables, torture devices, stools, chairs, and other useless junk. Going outside to the balcony, you will find some stocks and racks, as well as some broken chairs. There's nothing more here, so let's move on. This is the third floor of the arena. Here, you will find General Khazard. This is apparently his headquarters. In the room, there is mostly decorative pieces surrounding the room. Let's go back down to the ground floor, to the northwest room of the building. This room is the entrance to the actual arena, though you really can't enter here because the door is locked. 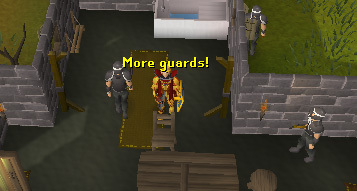 There is a few guards here, and nothing more. Moving west through the room, you will find more jail cells. 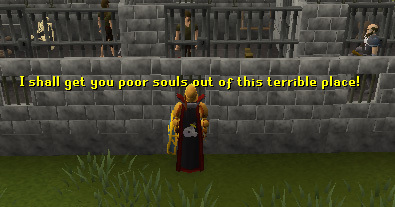 And with the cells, you will find more slaves, as well as guards. That is it for the arena itself. 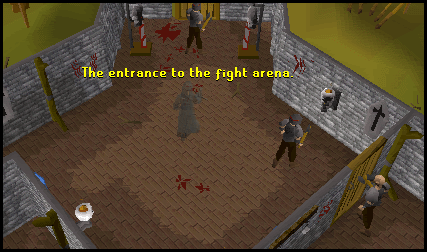 If you've already completed the Fight Arena quest, then you cannot enter the arena to fight again. The pub in the Fight Arena offers both beer and Khali brew. They can be purchased by speaking with the Khazard barman. The beer costs 2gp, while the Khali brew costs 5gp. You need to buy Khali brew during the Fight Arena quest. Other than the ales, you will find some tables and chairs, as well as two Khazard Guards. This is another house with a sink. It features a cooking pot though, and it can be used as a range, making this house probably the most useful out of the rest. There are some tables and a few stools, but that's it for this house. This house just features a sink, with some tables and chairs, the usual mix in this city. There is nothing more to point out here, so we can move on. The final stop on our journey is one that probably no one will ever visit, as it features absolutely nothing. A smashed table, two chairs, a stool, and a regular table is all that can be seen here. 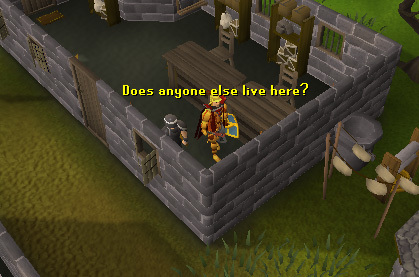 It is the smallest building in the Fight Arena area, and apparently houses no one.